The first setup I want to present was published by Linda Raschke in her book Street Smart. 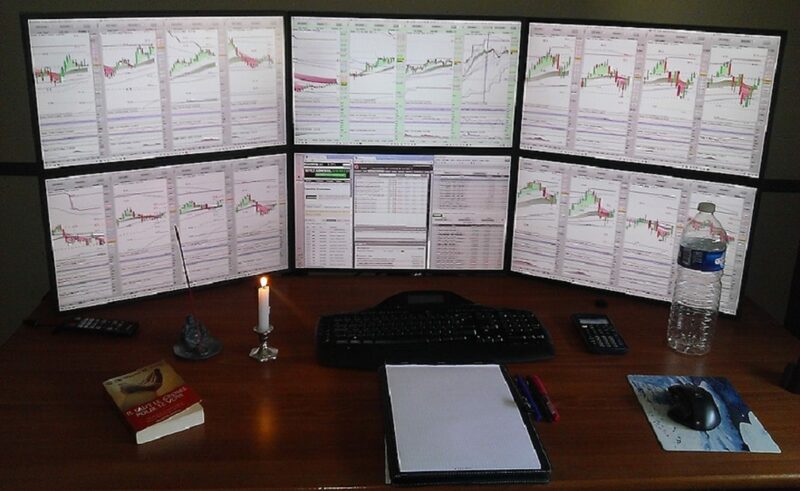 The setup is by no means THE holy grail but well it wasn’t me who named it. It is a pretty simple setup that speculates on the continuation of a strong trend after a pullback. “When prices make new highs(lows) in a strong trend, you should always buy(sell) the first pullback. The Holy Grail is a precise method we use to measure when to enter a position after a retracement. Once we are in this trade, we are looking for a continuation of the previous trend. One of the two outcomes typically follows. The retest will either fail at the previous high/low in which case a small profit can usually be made. In the second scenario, a whole new continuation leg begins. At the very least, one is offered a very low-risk entry point with several options for managing the exit thereafter. 1.) A 14-period ADX must initially be greater then 30 and rising. This will identify a strongly trending market. 2.) Look for a retracement in price to the 20-period exponential moving average (EMA20). Usually the price retracement will be accompanied by a turndown in the ADX. 3.) When price touches the EMA20 put a buy stop above the high of the previous bar. 4.) Once filled, enter a protective stop at the newly formed swing low. Trail the stop as profits accrue and look to exit at the most recent swing high. If you think the market may continue its move, you might exit part of the position at the most recent swing high and tighten stops on the balance. 5.) If stopped out, re-enter this trade by placing a new buy stop at the original entry price. I used the original rules (except rule 5, I think it is better to wait for a new, fresh setup to form than re-entering a stopped out trade) above and programmed a screener that searches for the setup and an indicator to visualize both entry price and stop loss. And this is what the result looks like. 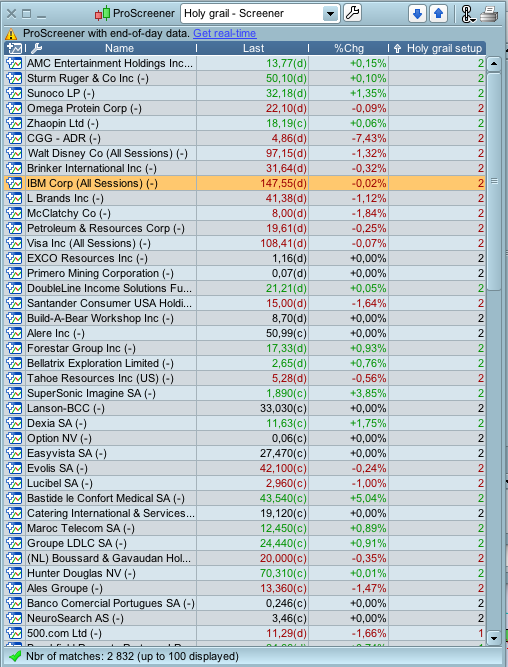 I screened all stocks from the NYSE for the setup on a daily timeframe. We got several hits. In the rightmost column which is named “Holy grail setup” you find either a “1” for long setups or a “2” for short setups. Let’s have a look at two examples. 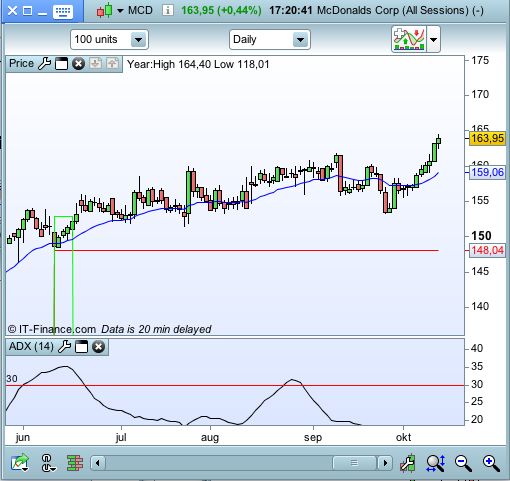 First we take Mc Donalds as an example for a long trade. Here you see the setup forming in the beginning of june with a pullback to the EMA20 (blue line). This happens while the 14-period ADX is above 30 (to see the ADX please activate the builtin ADX-indicator of the platform). 4 days later a long trade is triggered when price exceeds the light green line. The stop loss for the trade is the red line. Now let’s have a look at a second example. 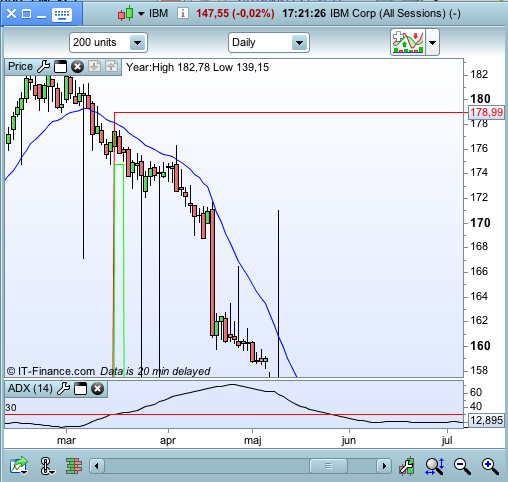 This time it is a short setup and it is IBM we are looking at. In the middle of march the setup forms in a downtrend with a pullback to the EMA20 (blue line) while the 14-period ADX is above 30. Only 3 days later a short trade is triggered when price crosses under the light green line. The stop loss for this trade is again the red line.